About this picture: Thursday (and Saturday and Tuesday) is bath and shower day in the Blauwkamp household, and today Logan and Caleb elected to take a bath. They were so cute in the bath together that I just had to take a picture of them (maaaa-om!). What you don't see (or actually, you can just see a little bit of) is that the colors of the shampoos and soaps all match the decor of the bathroom. Just an indication of one of my many compulsions. In fact, up until a week ago, I had orange baby wash in that bathroom, and that was OK, because I had burgandy body wash (the colors in that bathroom are a mossy green and burgandy). Now the body wash is also green and the orange clashed horribly, so I had to replace it with green. The labels all have to be facing forward, too. Have you seen the commercial for NEW Just Bunches? I think it's pretty funny. All those guys in a wind tunnel with their bowls of Honey Bunches of Oats, blowing the flakes away. By the way, I really thought I would like Just Bunches a lot, because Honey Bunches of Oats is one of my favorite cereals, and I like the bunches the best, but it was too much of a good thing. So the plan is to buy both cereals at the same time and then mix them to my liking. I can see how middle children might have issues. Everyone always pays more attention to the youngest--we parents of youngest children would say that's because it's necessary to pay more attention because they are less independent and need more help, but it doesn't really matter that there's a good reason: the fact remains that the youngest gets the most attention. The youngest is always cuter, too, if only for the reason that behaviors that are cute at age 1 are completely unacceptable at age 5. Then there's the oldest. He always gets to do everything first. And everyone's really excited when the oldest does something first, but by the time the middle child gets around to doing that same thing, it's old news. Doesn't matter that it's a first for the middle child, it's just not nearly as exciting as when the oldest did whatever it was. 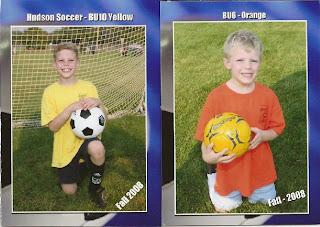 Case in point: I have already cut down on the number of sports pictures that I buy of the kids, even though this fall is only Logan's 2nd time ever playing a sport. Cody's been playing sports for years, so it's old hat. The middle child never gets anything new, because he's getting hand-me-downs from the oldest, but the youngest gets new stuff because the combination of the oldest and middle children using things wears them out. There are never any pictures of just the middle child. The oldest child gets pictures taken of all those firsts that are just not as exciting by the time the middle child gets to do them, and the youngest child is just so darn cute, but the middle child only gets group shots. The youngest gets to spend time alone with mom or dad, because as I said before, he needs more attention. The oldest gets to spend time alone with mom or dad because he's off doing those things the middle child is still too young for (like Cub Scouts or Feed My Starving Children). The middle child always has to share: things, time, attention. Now we can say that the middle child used to be the youngest child, and that's true, he used to enjoy all the perks of youngest-dom. But is that few years of being the youngest enough to make up for a life-time of always being in the middle? And since I'm at the library, I feel inspired to let you all know that I am on book overload right now. Usually I read one book at a time, and I'm good with that. I love to read, in fact, you could say it's my main form of recreation these days. Right now I'm reading Tune In: Hearing God's Voice Through the Static for my Sunday morning women's group, and I'm reading The Five Love Languages for a local mom's group, and I'm reading various fiction titles (one at a time) for fun. And I was reading Three Simple Rules, because our sermons in September were based on that (small) book, and I'm reading the Bible, and I have on my nightstand, Facing Your Giants, recommended to me by my sister in law (and so of course I want to read it, if she thinks it's a good book). Oh, and tonight I will begin reading Captain Underpants with Cody. So the problem is, I'm having a hard time deciding which one to read, when I get some time to read. I'm also having a little tiny bit of trouble keeping everything straight (I need to have ch. 1, days 1-3 of Tune In read by Sunday, and chapters 5-6 of Love Languages read by some Thursday in October...maybe the 3rd Thursday?). When I see it typed out like that, it doesn't seem like so much. I think to myself, what are you complaining about? It's only 3 books (plus the Bible) that you're currently reading, and you'll get to Facing Your Giants some other time (if you can remember that Jodi recommended it). Perhaps the real problem is my brain is so full of other stuff, some of which I actually use from time to time, that adding just that tiny bit to it throws my brain into overload. Humph.